Palestinian Child when Breaking into Selwan Village in Jerusalem. Palestinians shepherd in the Gaza Strip. of the Palestinian resistance were killed by IOF in the southern Gaza Strip. 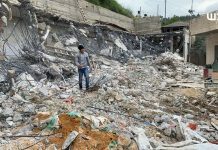 – 4 Palestinian civilians were wounded. – IOF arrested 6 Palestinian fishermen and confiscated their boat. warplanes attacked a number of targets in the Gaza Strip. to use force against peaceful protests in the West Bank. civilians and an Israeli photojournalist were wounded. incursions into Palestinian communities in the West Bank. Palestinian Legislative Council and 7 children. Bank arrested one Palestinian civilians. attack Palestinian civilians and property. 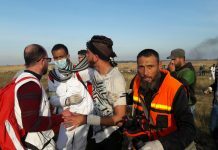 Israel killed a Palestinian shepherd in the northern Gaza Strip. the border between the Gaza Strip and Israel to the east of Khan Yunis. a child, were wounded by Israeli gunfire. also bombarded tunnels along the Egyptian border south of Rafah. were wounded and then arrested by Israeli soldiers. situation in the Gaza Strip. culturally and academically isolated from the rest of the world. on Civil and Political Rights. reduction of restrictions imposed on the entry of goods. minimal needs of the Gaza Strip. imposed a ban on all exports from the Gaza Strip. levels of poverty and unemployment have mounted sharply. West Bank and the Gaza Strip continue to be denied access to Jerusalem. constructed inside the West Bank itself, further confiscating Palestinian land. closed or fully controlled by IOF. Jerusalem, is inaccessible to Palestinians without a permit issued by the IOF. These permits are extremely difficult to obtain. construction of the Annexation Wall. Bank, including being regularly stopped and searched in the streets by IOF. at creating a Jewish majority in Jerusalem. land and confiscated some civilian property. 2010, dozens of Israeli settlers, escorted by IOF, from "Missa Ya’ir"
destroyed the fence of the land and damaged a water well..
settlers also uprooted a number of small trees. two mobile phones, two television sets and a digital camera. while the first one remained in the intensive care unit. the family of Mahmoud Ahmed Zakarna, 22, and arrested him. 200 meters away from the border. approximately 13:40, and no house raids or arrests were reported. house raids or arrests were reported. pronounced dead at approximately 17:30.
he was nearly 500 meters away from the border. village later, and no arrests were reported. searched the area and fired flash bombs. 11 rubber-coated metal bullets to the chest. A number of boys also suffered from tear gas inhalation. patrolled in the streets for some time and withdrew later. No house raids or arrests were reported. near al-Salam neighborhood in the south of Rafah. No casualties were reported. al-Brazil neighborhood in the south of Rafah. No casualties were reported. car in the area were injured, and the site was heavily damaged. Beit Lahia, was wounded by a bullet to the right foot. to the Radwan family, but no arrests were reported. number of houses, but no arrests were reported. throwing stones at Israeli soldiers positioned near the annexation wall. the streets for some time and withdrew later. No house raids or arrests were reported. streets for some time and withdrew later. No house raids or arrests were reported. detained in Israeli jails for 4 years and was released in late 2009.
able to evacuate his body at approximately 17:15. Farassini’s tractor claiming that it was unlicensed. fire at Palestinian farmers in the area. The farmers were forced to flee from the area. No casualties were reported. photojournalist, hit by a tear gas canister to the foot. inhalation and others sustained bruises as they were beaten by Israeli soldiers. demonstrators suffered from tear gas inhalation, and others sustained bruises. al-Tamimi, 50, wounded by a rubber-coated metal bullet to the head. al-Zahed neighborhood in the center of Hebron towards "Beit Rumano"
roads in the old town. al-Quds daily, but released them two hours later. Additionally, IOF closed the checkpoint. suffered from tear gas inhalation and others sustained bruises. tear gas inhalation and others sustained bruises. as the International Covenant on Civil and Political Rights. allowed to travel through it. Palestinians and the body of a dead one were allowed into the Gaza Strip. Palestinians were allowed to travel to Egypt and 228 others were allowed into the Gaza Strip. Palestinians were allowed to travel to Egypt and 208 others were allowed into the Gaza Strip. flowers and 6.337 tons of strawberries. flowers and 17.5 tons of strawberries. flowers and 11 tons of strawberries. 2010, and allowed the entry of 2,379 tons of wheat and 2,457 tons of fodders. restrictions that include prolonged checking. Palestinians from praying at al-Aqsa Mosque. Beit Liqya village, west of Ramallah. They stopped and searched Palestinian civilian vehicles. stopped and searched Palestinian civilian vehicles. and searched Palestinian civilian vehicles. 21, from al-Far’a refugee camp south of Tubas. him in a jeep towards an unknown destination." Palestinian civilians in East Jerusalem. demolished 7 mobile rooms that served as stores belonging to Ahmed Abu Adam. family is comprised of 9 individuals. 2o olive trees belonging to Ibrahim al-Balbissi. land, which are often attacked by Israeli settlers and closed by IOF. fleeing in a car towards the nearby by "Sousia" settlement. in the OPT and to provide immediate protection for Palestinian civilians. and prosecute those responsible for grave breaches, namely war crimes. Annexation Wall inside the West Bank illegal. prohibit import of goods produced in illegal Israeli settlements in the OPT. facilitation of family visitations to Palestinian prisoners in Israeli jails. international organizations to the OPT. 282 4776 – 282 5893).